Country forming the northern part of Great Britain. Jews have been settled there only since the early part of the nineteenth century. In 1816 there were twenty families in Edinburgh, which was the first Scottish city to attract Jewish settlers. 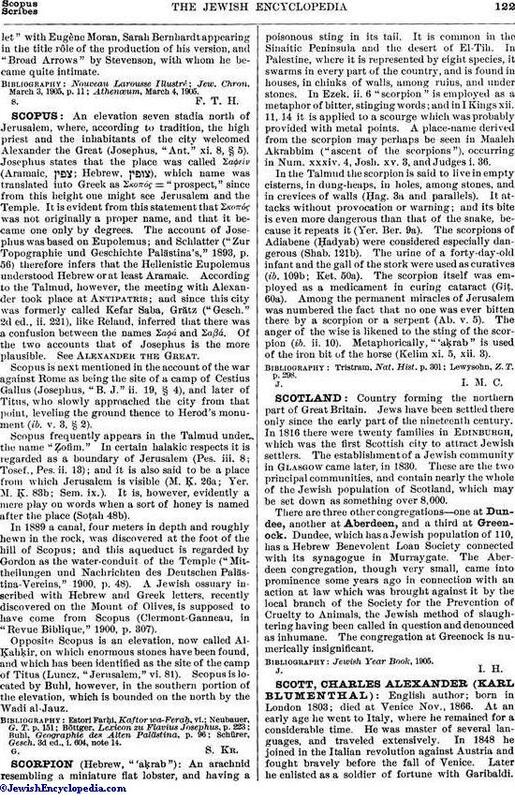 The establishment of a Jewish community in Glasgow came later, in 1830. These are the two principal communities, and contain nearly the whole of the Jewish population of Scotland, which may be set down as something over 8,000. There are three other congregations—one at Dundee, another at Aberdeen, and a third at Greenock. Dundee, which has a Jewish population of 110, has a Hebrew Benevolent Loan Society connected with its synagogue in Murraygate. The Aberdeen congregation, though very small, came into prominence some years ago in connection with an action at law which was brought against it by the local branch of the Society for the Prevention of Cruelty to Animals, the Jewish method of slaughtering having been called in question and denounced as inhumane. The congregation at Greenock is numerically insignificant.